Many Lammas blessings to those of us in the Southern Hemisphere, as the seasons start to change we are preparing for the cooler days as we head towards Autumn. Blessed Be! At Lammas, also called Lughnasadh, the hot days are upon us, much of the earth is dry and parched, but we still know that the bright reds and yellows of the harvest season are just around the corner. Apples are beginning to ripen in the trees, our summer vegetables have been picked, corn is tall and green, waiting for us to come gather the bounty of the crop fields. Now is the time to begin reaping what we have sown, and gathering up the first harvests of grain, wheat, oats, and more. In early Ireland, it was a bad idea to harvest your grain any time before Lammas — it meant that the previous year’s harvest had run out early, and that was a serious failing in agricultural communities. However, the first sheaves of grain were cut by the farmer, and by nightfall his wife had made the first loaves of bread of the season. Lugh is also known in some traditions as the patron of bards and magicians. Now is a great time of year to work on honing your own talents. Learn a new craft, or get better at an old one. Put on a play, write a story or poem, take up a musical instrument, or sing a song. Whatever you choose to do, this is the right season for rebirth and renewal, so share your new skill with your friends and family. 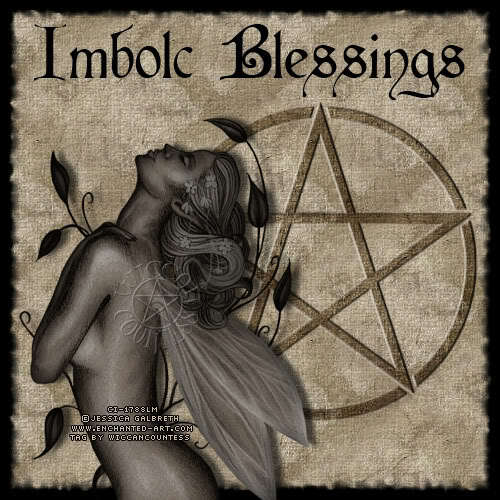 To all in the Northern Hemisphere I wish you a blessed Imbolc as you move towards Spring. I hope you begin to feel warmer as the snow melts and the sun shines. Blessed Be! It is traditional upon Imbolc, at sunset or just after ritual, to light every lamp in the house-if only for a few moments. Or, light candles in each room in honor of the Sun’s rebirth. Alternately, light a kerosene lamp with a red chimney and place this in a prominent part of the home or in a window. Foods appropriate to eat on this day include those from the dairy, since Imbolc marks the festival of calving. Sour cream dishes are fine. Spicy and full-bodied foods in honor of the Sun are equally attuned. Curries and all dishes made with peppers, onions, leeks, shallots, garlic or chives are appropriate. Spiced wines and dishes containing raisins-all foods symbolic of the Sun-are also traditional. A symbol of the season, such as a representation of a snowflake, a white flower, or perhaps some snow in a crystal container can be placed on the altar. An orange candle anointed with musk, cinnamon, frankincense or rosemary oil, unlit, should also be there. Snow can be melted and used for the water during the circle casting. Arrange the altar, light the candles and censer, and cast the Circle of Stones. Invoke the Goddess and God. to welcome the rebirth of the God. Beneath its mantle of sleep. All the land is wrapped in winter. Mother Goddess, Lady of all fertility. Hail Great God! Hail and welcome! Stop before the altar, holding aloft the candle. Gaze at its flame. Visualize your life blossoming with creativity, with renewed energy and strength. If you need to look into the future or past, now is an ideal time. Blessed Imbolc to all of us in the Southern Hemisphere. Although it is still cold and wintery, the gardens are beginning to sprout with their beautiful winter flowers. Here our gardens are lush with Camelias and Rhoddodenrons. Blessed Be! 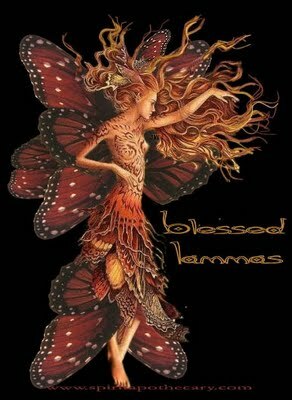 Blessed Lammas to all in the Northern Hemisphere as you enjoy the summer sun and head towards the cooler days of Autumn/Fall. Blessed Be! Lammas blessings to those of us in the Southern Hemisphere as we flow through the summer months, although I have to say today is cold up here on the mountain, I am sitting here with jumper and ugg boots, and a warm cat curled up beside me trying to keep warm. Blessed Be! Right My Lord is the passion, He brings forth the light, The harvest is of his seed. Left My Lady is the power, She brings forth the life, The harvest is her reward. That I shall reap, that which I have sowed. For nothing is withheld from those deserving. And blessed shall be the fruits of my labor. With love and work I gave them birth. Through them I achieved my wishes and needs. As the corn, I am reborn. Long after all has withered and died. remember, just as the corn, That I am ever living, dying, and reborn. As the corn, I am reborn! Corn and grain Bring joy and gain! Vainly should my lips express. And pray this time and place you bless. Bring me blessings from your harvest home. As now the season of abundance begins to wane. Take up the circle and allow the gold candle to burn out. Hang the ears of corn to dry. When the ears of corn have completely dried, save them to make your corn-baba for Autumn Equinox. A blessed Imbolc to everyone in the Northern Hemisphere, stay warm and toasty during the snowy days. Blessed Be! To those of us in the Southern Hemisphere I wish you a blessed Imbolc as we head towards Spring. It is still cold and wet here but we look forward to the warmer days. To all in the Northern Hemisphere I wish you a blessed Lammas as the heat beats down and slowly turns to cooler days. Bright Imbolc blessings to those in the Southern Hemisphere as we look forward to warmer days and bright coloured gardens. Below is a ritual from Scott Cunningham. To all in the Northern Hemisphere I wish you warm blessings as you move towards the autumn and winter months. Lammas (Lughnasadh) is one of the eight “sabbats” or solar festivals in the Wiccan Wheel of the Year. It is the first of the three autumn harvest festivals, the other two being the Autumn equinox (or Mabon) and Samhain. Some Wiccans mark the holiday by baking a figure of the god in bread, and then symbolically sacrificing and eating it. The Celtic name seems to have been a late adoption among Wiccans, since in early versions of Wiccan literature the festival is merely referred to as “August Eve”. Many Wiccans also use the name Lammas for the sabbat, taken from the Anglo-Saxon and Christian holiday which occurs at about the same time. As the name (from the Anglo-Saxon hlafmæsse “loaf-mass”, “loaves festival”) implies, it is an agrarian-based festival and feast of thanksgiving for grain and bread, which symbolizes the first fruits of the harvest. Wiccan and other eclectic Neopagan rituals may incorporate elements from either festival.